Gov. Doug Ducey is dominating challenger David Garcia, according to a poll by Arizona Capitol Times and OH Predictive Insights. 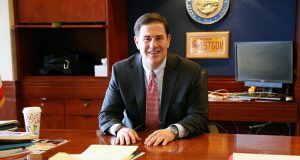 Tax filings by the conservative nonprofit organization American Encore confirm that Doug Ducey’s longtime ally Sean Noble was at the center of the multimillion-dollar dark money campaign that helped get him elected.